DIE Lunæ, 7 die Maii. Message to the H. C. with the Marquis of Winton's Order. Bill to prevent Disputes concerning the Parliament. Message from the H. C. for the E. of Manchester to be One of the Commissioners of the Great Seal;-and with a Declaration to prevent Riots. King's Statues to be set up. Message to the H. C. with a Bill. Message to the H. C. for Committees to meet, about the King being proclaimed. Ly. 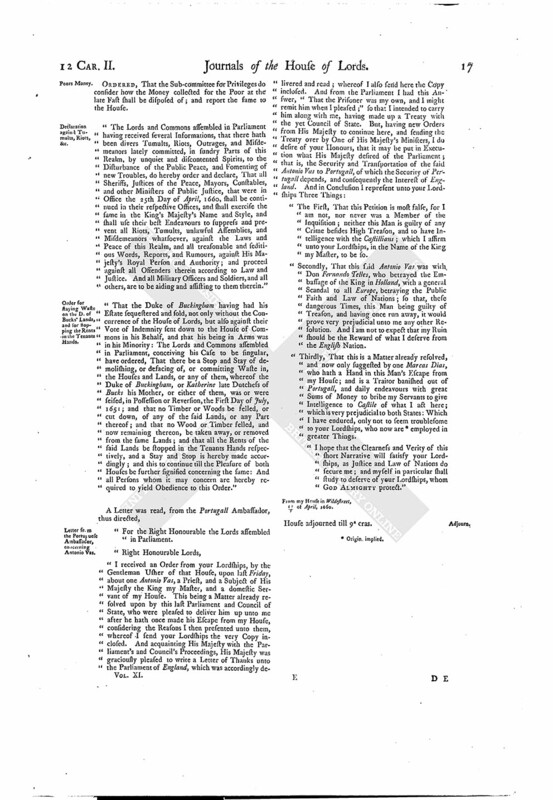 Jermyn and Long, about the Chancery Records. Letter from him, desiring Leave to do so. Declaration against Tumults, Riots, &c.
Order for staying Waste on the D. of Bucks' Lands, and for stopping the Rents in the Tenants Hands. Letter from the Portuguese Ambassador, concerning Antonio Vas. 24 Viscount Say & Seale. 2 Comes Oxon. 18 Ds. Howard Esc. To desire their Concurrence in the Order for preventing of Waste upon the Lord Marquis of Winchester's Estate. 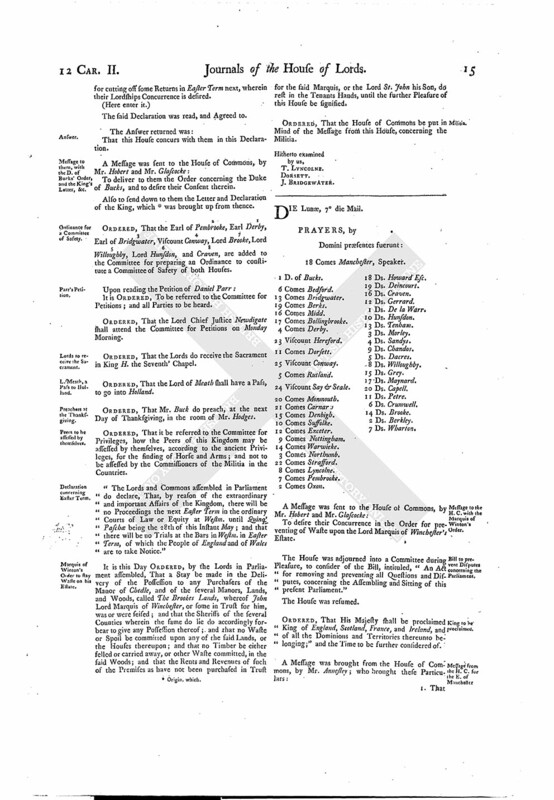 The House was adjourned into a Committee during Pleasure, to consider of the Bill, intituled, "An Act for removing and preventing all Questions and Disputes, concerning the Assembling and Sitting of this present Parliament." ORDERED, That His Majesty shall be proclaimed King of England, Scotland, France, and Ireland, and of all the Dominions and Territories thereunto belonging;" and the Time to be further considered of. 1. That the House of Commons doth agree with the Lords, that the Earl of Manchester, Speaker of the House of Peers, be, and is hereby nominated and appointed, One of the Commissioners for the Great Seal; and that he be added to those who have the present Custody thereof, till further Order. 2. A Declaration for continuing of Officers in His Majesty's Name, and preventing of Riots and Tumults, &c.
That their Lordships do concur with the House of Commons in this Declaration. After this, the House was again adjourned into a Committee during Pleasure, to debate the Bill for removing of all Questions and Disputes for the Assembling and Sitting of this present Parliament. The Earl of Manchester reported, "That the Lords think fit to offer a Proviso and an Amendment to the aforesaid Bill." Which being read Twice, and approved of, then the said Bill was read the Third Time, with the said Proviso and Alteration. And the Question being put, "Whether this Bill shall pass as a Law, with this Proviso and Alteration?" It is ORDERED, To be sent to the House of Commons, for their Concurrence. ORDERED, That the Earl of Berks be added to the Committee for Privileges; likewise the Duke of Bucks, Earl of Exeter, Earl Monmouth, the Lord Tenham, Lord Morley, Lord Sandys, Lord De la Warr. It is referred to the Committee of Privileges, to consider the Setting up the Statue of the late King, in Scotland, Ireland, and in The Covent Garden. To let them know, that their Lordships have agreed to the Bill concerning the preventing the Questions about this Parliament, &c. with a Proviso and Amendment, wherein their Lordships desire their Concurrence. That they concur and agree with this House, in the Order sent down concerning the Duke of Bucks. 2 E. of Bedford. 4 Ds. Maynard. It is ORDERED, That this Business between him and the said Lady shall be heard To-morrow in the Afternoon, before the Lords Committees for Petitions; and their Report thereof to be made to this House on Wednesday Morning. That they do concur with their Lordships in the whole Message concerning the Proclaiming of His Majesty; and they have nominated a Committee of their House, of a proportionable Number, to meet this Afternoon, as is desired. ORDERED, That the Earl of Exeter be added to the Committee, to prepare a Bill for the constituting General Monck Captain General. That they will send an Answer, by Messengers of their own, concerning the Marquis of Winchester's Order. That they do agree with their Lordships in the Proviso and Alteration in the Bill concerning preventing the Questions and Disputes concerning the Assembling and Sitting of this present Parliament. A Letter from General Mountague, at Sea, was read; and ORDERED, That the Speaker of this House do write a Letter to General Mountague, to give him Thanks from this House, for his Respects to this House; and to let him know, that this House do give General Monck and him Leave to send such an Answer, either jointly or severally, as they think fit, to His Majesty. Nazeby, in The Downes, 4 May 1660. ORDERED, That the Sub-committee for Privileges do consider how the Money collected for the Poor at the late Fast shall be disposed of; and report the same to the House. 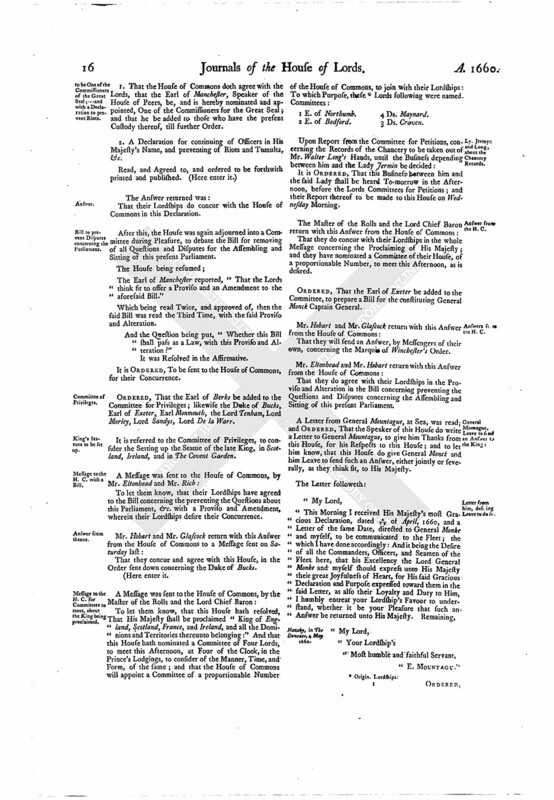 "The Lords and Commons assembled in Parliament having received several Informations, that there hath been divers Tumults, Riots, Outrages, and Misdemeanors lately committed, in sundry Parts of this Realm, by unquiet and discontented Spirits, to the Disturbance of the Public Peace, and Fomenting of new Troubles, do hereby order and declare, That all Sheriffs, Justices of the Peace, Mayors, Constables, and other Ministers of Public Justice, that were in Office the 25th Day of April, 1660, shall be continued in their respective Offices, and shall exercise the same in the King's Majesty's Name and Style, and shall use their best Endeavours to suppress and prevent all Riots, Tumults, unlawful Assemblies, and Misdemeanors whatsoever, against the Laws and Peace of this Realm, and all treasonable and seditious Words, Reports, and Rumours, against His Majesty's Royal Person and Authority; and proceed against all Offenders therein according to Law and Justice. And all Military Officers and Soldiers, and all others, are to be aiding and assisting to them therein." "That the Duke of Buckingham having had his Estate sequestered and sold, not only without the Concurrence of the House of Lords, but also against their Vote of Indemnity sent down to the House of Commons in his Behalf, and that his being in Arms was in his Minority: The Lords and Commons assembled in Parliament, conceiving his Case to be singular, have ordered, That there be a Stop and Stay of demolishing, or defacing of, or committing Waste in, the Houses and Lands, or any of them, whereof the Duke of Buckingham, or Katherine late Dutchess of Bucks his Mother, or either of them, was or were seised, in Possession or Reversion, the First Day of July, 1651; and that no Timber or Woods be selled, or cut down, of any of the said Lands, or any Part thereof; and that no Wood or Timber selled, and now remaining thereon, be taken away, or removed from the same Lands; and that all the Rents of the said Lands be stopped in the Tenants Hands respectively, and a Stay and Stop is hereby made accordingly; and this to continue till the Pleasure of both Houses be further signified concerning the same: And all Persons whom it may concern are hereby required to yield Obedience to this Order." "For the Right Honourable the Lords assembled in Parliament. "The First, That this Petition is most false, for I am not, nor never was a Member of the Inquisition; neither this Man is guilty of any Crime besides High Treason, and to have Intelligence with the Castillians; which I affirm unto your Lordships, in the Name of the King my Master, to be so. "Secondly, That this said Antonio Vas was with Don Fernando Telles, who betrayed the Embassage of the King in Holland, with a general Scandal to all Europe, betraying the Public Faith and Law of Nations; so that, these dangerous Times, this Man being guilty of Treason, and having once run away, it would prove very prejudicial unto me any other Resolution. And I am not to expect that my Ruin should be the Reward of what I deserve from the English Nation. "Thirdly, That this is a Matter already resolved, and now only suggested by one Marcas Dias, who hath a Hand in this Man's Escape from my House; and is a Traitor banished out of Portugall, and daily endeavours with great Sums of Money to bribe my Servants to give Intelligence to Castile of what I act here; which is very prejudicial to both States: Which I have endured, only not to seem troublesome to your Lordships, who now are (fn. 2) employed in greater Things. "I hope that the Clearness and Verity of this short Narrative will satisfy your Lordships, as Justice and Law of Nations do secure me; and myself in particular shall study to deserve of your Lordships, whom God Almighty protect." From my House in Wildestreet, 17/7; of April, 1660.